The RBA decision is coming up in a bit, so I’m looking at this resistance test to see if I can trade the news. Any guesses what my bias is? I’m seeing this descending triangle pattern on the 4-hour time frame as price made lower highs and found support around the 77.80 to 78.00 levels. Price gapped up over the weekend and is currently testing the resistance, still deciding whether to make a bounce or a break. Stochastic is already indicating overbought conditions or exhaustion among buyers, which suggests that a return in bearish pressure may be in order. 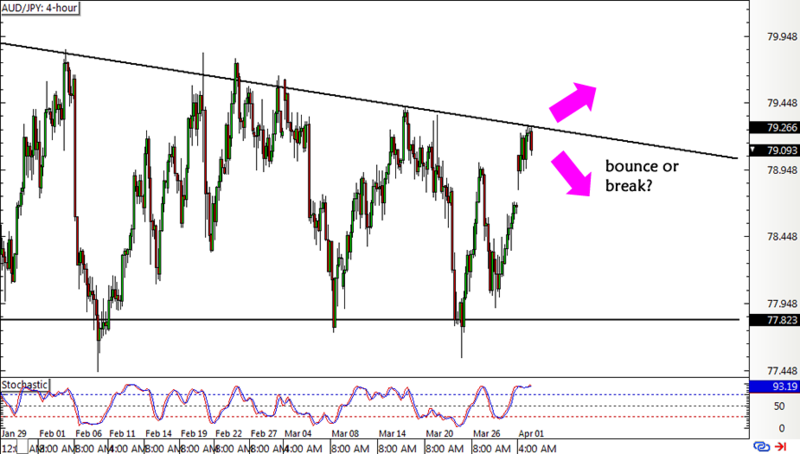 This could take AUD/JPY down to the bottom of the triangle or perhaps for a break lower. Besides, the pair has yet to fill that weekend gap! This could all boil down to the upcoming RBA statement as their bias could shape interest rate expectations in the coming months. Recall that their neighbor, the RBNZ, already shifted to a more dovish stance in hinting that they’re likely to cut rates sometime this year. I wouldn’t be surprised if the RBA does take the same cautious tone since most of its economy has likely been hurt by ongoing trade tensions. Not only can this weigh on exports and business production, but it also keeps risk appetite in check, something that is bearish for AUD and bullish for JPY. However, I’m also wary of the dovish tone of the BOJ these days as this central bank is also open to stepping up its easing efforts in case inflation prospects become dim. Still, given the geopolitical uncertainties currently in play, I’m inclined to think that the lower-yielding yen might have room for gains. As you can probably tell, I’m short-biased on this pair and I’m hoping to catch some momentum during the actual announcement. Of course I’m also open to the idea of going long on an upside break, but I might have to wait for a pullback entry in that scenario instead.